Parts 1, 2 and 3, as well as the stages or skills within each part, can be administered in any order. The three parts do not have to be conducted on the same day. 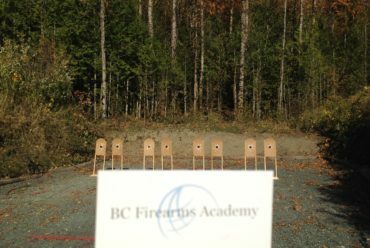 An officer must successfully complete/pass all aspects of the BC Pistol Qualification in order to be qualified to carry and use a pistol.Records must be kept in accordance with BCPPS 1.1.2 (8). 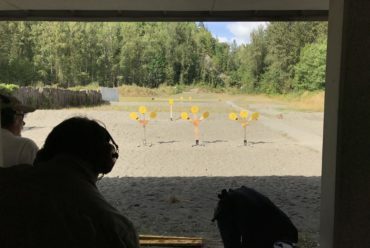 An officer will have three attempts to pass each stage of Part 1 and each skill of Part 2 of the BC Pistol Qualification. If an officer does not pass on any stage or skill, the officer will receive remediation/coaching prior to the third attempt. Once a stage or skill is passed, it does not need to be repeated. If an officer does not pass a stage after three attempts, the officer is not qualified to carry and use a pistol and must return on a subsequent day and re-test on all the stages. (1) Every round fired must be within the prescribed scoring area (i.e., 100% accuracy). (3) There must be no violation of universal safe handling procedures. (1) The target must be a human silhouette with a maximum of 30 inches (76 cm) long and 17 inches (43 cm) wide. Within the silhouette, the head should be a maximum of 10 inches (25 cm) long and 7 inches (18 cm) wide. (2) For head shots the shots must be within the neck and head of the target. The neck is defined as above the line of where body armour ends. (3) For all other stages a shot striking anywhere on the silhouette target and fully enclosed on the silhouette are considered successful hits. These skills can be tested separately from the Course of fire. Alternatively some of these skills can be incorporated into the Course of fire (e.g., Phase 1 stoppage and emergency reload). These skills must be performed to the satisfaction of a police force firearms instructor. Note: If the phase 1 stoppage and emergency reload is tested as part of the Course of fire, 2 additional seconds are added to the particular stage in which it is included. The skill tests below can be conducted in any order. Each year every officer must complete practice firing of their pistol for a minimum of 100 rounds, including the rounds fired during the annual course of fire test.